Design is something of an unsung hero in the video game industry, taking a back seat to gameplay and especially graphics. By design, I’m not just talking about ideas. I’m talking about how one has access to those ideas. How neatly they all fit into the core experience, and how those that do it right never get the recognition they deserve. Because if designers did their job right, it’ll blend in so well that the public will be unaware that they ever even did anything in the first place. The sad reality is that it’s a thankless job to design things like interfaces and menus, and the only recognition one will ever receive in that line of work is complaints that they’re doing it wrong. Still, it’s important to be aware of what’s wrong so that it can be fixed, or at least done correctly on the next go. So in this article, I’m going to list the worst design choices in games in the past few years. Perhaps if all goes well, I’ll even add a “sequel” article for the best design choices. Why did I start with the worst choices? Because complaining is fun. Don’t look at me like that, you know I’m right. 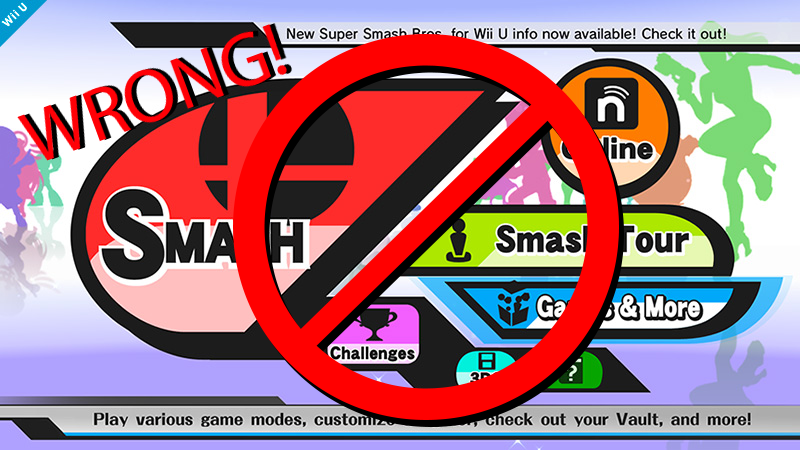 There’s plenty of things wrong with the new Smash Bros’ menu, such as no touchscreen support for whatever reason, but chief among them is that the whole interface is a nightmare to navigate. I don’t think I ever played a game where it took me ten minutes to figure out how to find my way around a main menu before, but Smash Bros managed to find a way. This is particularly curious as it’s the fourth game in the series of strange-looking menus, but in all those prior cases at least everything was where you expected it to be. Smash Bros 4, on the other hand, puts things in the weirdest places. There’s a big SMASH! button on the far left reserved for the multiplayer mode, which, granted, is something that probably everybody’s going to be spending the most time in. But I wasn’t even aware of the old-school “Classic” mode’s existence, which is apparently the only way to unlock items for Mii and character customization, until I accessed the surprisingly tiny “Games & More” menu. Originally, I assumed it was the place one would stick the less popular minigames, like that game where you try to see how far you can hit the punching bag with a home run bat, or the survival mode. Given that most of the game’s unlockables can be found here, why was “Games & More” tucked away into a tiny button in the corner? Look at it! It’s even under the really unpopular Smash Tour mode! 20/20 hindsight aside, given that “Games & More” is the best place to get all the unlockables, you’d think it’d be a little more prominent. You beat the game on all its difficulties. You uncovered every secret, collected every collectible, explored every nook and cranny. Now, you wanna blow stuff up. But you don’t want to take it online; you just want a safe, nurturing environment filled with stake guns, rocket launchers, and hordes of moronic demons to mow through like a lawn. And, if you have a laptop, you want to take it on the go. What’s this? *Gasp! * You need an internet connection! And the best you can do is Starbucks Wi-Fi! Nooooooooooooo! I’m something of a sucker for survival mode. That is, I’m a sucker for anything with potentially limitless replay value. Survival mode, random dungeons, modding (especially modding), et cetera. I’m also always somewhere else, which forces me to stay as a laptop gamer instead of building a proper tower computer. Put that all together, and you spell “disappointment.” The real problem with this is that you usually delve into survival modes because you want to shoot stuff in an open map and not have to deal with online players who are obscenely better than you in just about every way. So while it’s nice to play online and shoot stuff together, it just doesn’t make sense that they wouldn’t make it available for whenever your net connection goes down. Or if you forgot to pay your internet bills. Or if you’re at Starbucks. It’s an idea that sounds cool on paper. You get to select missions using a digital map that exists in the game’s universe in more ways than one. I mean, how cool is that? Payday 2 has you navigate a secret, underground network called Crime.NET, and Blacklist uses something called a Strategic Mission Interface. However, they both suffer the exact same problem; both interfaces are redundant and pointless, and they hurt to navigate through. Payday 2’s missions are scattered everywhere across the board regardless of the location the heists happen to take place, making the concept of a map useless in the first place, and difficult to aim a cursor over an available heist/server before your machine pings the Master Server again and refreshes the list. Blacklist actually has it worse, causing the usage of such an interface to substitute the Main Menu entirely, requiring you to load the airship you’re on before you can change your graphics settings. And even then, it’s difficult to tell which mission’s which, especially which chronological order they take place on a second playthrough without wiping out all your save data. Bummer. If you’re going to use a world-map level select system to simulate a world, why not make a... you know, world to go along with it? Dynamic missions? Single-And-Multiplayer events? If not, why not just stick to something that’s linear, legible, and easy to navigate? One of the reasons I bought Counter-Strike: GO was so that I could play, you know, Counter-Strike. And while the additional modes were fun in their own right, none of them but the original mode were the reason I got the game in the first place. I’m not a competitive gamer; I play games to have a good time. So imagine my shock when the matchmaking for the orginal game mode is apparently reserved for competitive gamers only. Granted, you can find people hosting the original game mode on the server browser, but you have to jump through a lot of hoops to find one, especially when so many servers host “Casual” matches instead (Casual is basically the original game mode, but with much higher cash-per-kill and automatically purchased armor, sans helmet apparently). It just feels so wrong to play the Casual mode, and it’s too much of an effort to play the game the way it was meant to be played if all you’re looking for is some good, clean, online fun. It’s cool on paper... well, not even on paper. It’s like that thing that sounds good in your head until you actually say it and realize how stupid that sounds. The Inventory Room, or the Sanctuary, might have been a pretty cool idea if not for the fact that virtually none of your inventory was readily accessible in Fable 3 on the PC. And that includes your spells, which in the first Fable were swappable at the push of a button. This leads to breaking up the action in ways even menus can’t manage to mess up, and causes you to start walking around in the Sanctuary’s equipment room to change spells before flinging you back to the action. It’s a system that’s too organized, and makes the combat all the worse for it. Now this is weird. Uncharted 3’s absolute best in terms of gameplay comes from the multiplayer mode, where it offers every mechanic available to Drake in an environment where the player is free to use said mechanics not according to a video game script. And Survival Mode is a pretty good place to practice for the online multiplayer, if you’ve had your fill of the single player campaign. However, you have to play this mode online. Usually, the game tries to match you up with two other players to form a three-man squad, but if that doesn’t work (or if they leave midgame) you found yourself playing solo. Which is good for practice (and your self-esteem, since this is the only way you don’t hear people shouting “omfg noob”), but really a shame. It’s especially odd since you can access the Survival Mode offline in splitscreen! Store Page is the First Option in the Main Menu! I love DLC as much as the next guy. By that, I mean I despise it with every fiber of my being, but that’s besides the point. It’s bad enough that most games give me notifications of new DLC available in the store when I’m just not interested in buying them. It’s even more nightmarish when they essentially become pop-ups that are the first thing to appear when you launch a game unless you plop down money to get the DLC to temporarily remove it from your beloved main menu. Allow me to repeat that. It stays there unless you spend money to remove it. This is especially horrible as it bumps down the entire list by placing it at the top, making it open the store page when you spam the enter key to skip the game’s opening cinematics instead of taking you into the Crime.NET menu. And you thought the “New Game” above the “Continue Game” option was bad. Shame, Overkill! Shaaaaaaaaaaaaaaaaaaaame! What do you think? Feel free to post other games you think have had terrible design decisions, whether it be menus, ideas, or otherwise!